To close out 2013, I thought I’d ask the cards for advice for 2014. 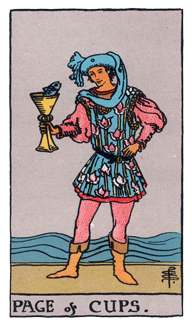 The card I got was the Page of Cups. I think the message is clear – be sweet, be kind, and be open to new experiences and to new love. Let positive emotions flow and try to look at the world with fresh eyes and a compassionate heart. There’s nothing heavy about this Page. She wants us to dance and play and be willing to make friends with everyone, even a talking fish in a cup. Let’s heed her advice. Go to it and let love rule our new year. You are currently reading Tarot Advice for the New Year at The Tarot Room.